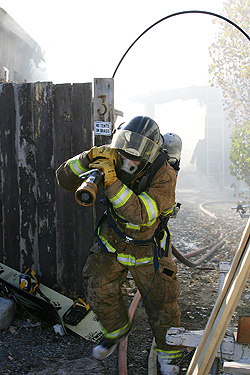 A Sun Valley firefighter pulls a one-and-three-quarter-inch ?attack line? Tuesday afternoon to a fire in two mobile homes behind Mountain View Grocery, at the south end of Ketchum. The homes caught fire shortly after 2 p.m., reports indicated. Ketchum, Sun Valley and Wood River Fire and Rescue fire crews responded to the scene, and rush-hour traffic backed up to the north and south. As of 3 p.m., the fire in both buildings was contained. Should Ketchum replace aging equipment? Proposition 2: Would it gut land-use planning? Working for a ?better place? So, where?s the Kentucky Fried Chicken?